Officials from the American Road & Transportation Builders Association and other groups weigh in on 2014 government construction and public works spending. The Washington-based American Road & Transportation Builders Association (ARTBA) is forecasting moderate growth in the overall U.S. transportation infrastructure construction market. ARTBA is predicting that the value of construction in the market will grow 5 percent from $129 billion in 2013 to $135.8 billion in 2014. ARTBA Chief Economist Alison Premo Black (photo at right) said expected double-digit growth in airport runway and terminal work will lead the way in transportation construction in 2014. Other leading segments include bridge and tunnel construction, waterways and ports, and heavy and light rail. Uncertainty about the level of federal support for state highway programs after September 2014, said Black, will depress the road pavement market somewhat in 2014. Black forecasts the pavement market will grow to $54.4 billion in 2014, up 2.6 percent nationally. This includes $42.7 billion in public and private investment in highways, roads and streets, and $11.6 billion in largely private investments in parking lots, driveways and related structures. The market, however, will be uneven nationwide, she says. ARTBA forecasts paving work to be up in 19 states, down in 20, and largely flat in the remaining 11. Following a strong 2013, the value of public works construction in the U.S. will fall by 5 percent to about $109 billion, predicts the “2014 Dodge Construction Outlook” from McGraw-Hill Construction. Improved state government revenues and higher municipal tax receipts will to some degree make up for lower federal funding, say Dodge analysts. Funding for some water-related public works projects will take a hit in 2014 as part of discretionary spending cuts that are mandated by the Budget Control Act of 2011. Local water and sewer authorities, however, have raised rates and increased bonding in order to update facilities and meet federal EPA surface water quality mandates and drinking water safety requirements. Public sector projects are underway or have been recently completed across the U.S. 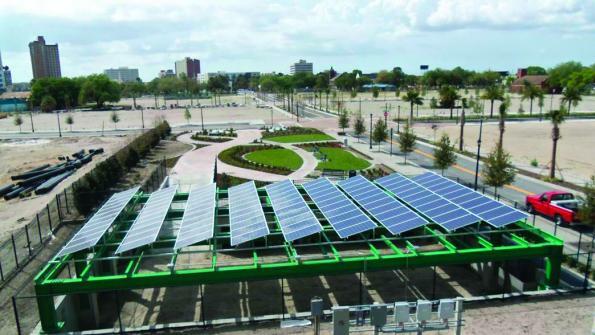 The Tampa Bay Housing Authority recently installed an efficient stormwater management-rainwater harvesting system and solar panel array at its Encore Tampa project in Tampa, Fla. The stormwater management system, located under the new community park, controls and harvests stormwater runoff to irrigate the new green space park. The $450 million Encore Tampa venture is a 28-acre sustainable, mixed-use development. Auburn, Wash.-based Oldcastle Precast designed and provided the modular underground retention structure for the new stormwater management system, which is designed to store, treat, and harvest stormwater runoff on the Encore Tampa site. The precast concrete Storm Capture retention system manages and controls the volume and discharge timing of stormwater runoff. The 18,000-square-foot, stormwater retention-harvesting system includes a Storm Capture vault composed of 146 10-foot-tall modules that can hold up to 33,000 cubic feet of water before recycling it for irrigation use. The entire Encore Tampa development has been designed and registered under the U.S. Green Building Council LEED 2009 New Construction and Major Renovations guidelines. This video showcases Encore, downtown Tampa’s new district developed in collaboration between the Tampa Housing Authority and Banc of America Community Development Corporation.